FILE - Visitors walk in front of a stands during weekend flea market in Isa Town, Bahrain, Feb. 10, 2018. In a report published Jan. 14, 2019, a group of Middle East researchers found that areas where residents are exposed to sectarian mixing are less prone to sectarian violence. Communities in the Middle East are showing the ability to resist the slide toward the worst sectarian impulses and draw lessons for cooperation, despite brutal conflicts, Middle East experts found in a new report published Monday. "Countering Sectarianism in the Middle East," a report by a group of seven Middle East researchers at the Rand Corporation, a nonprofit, nonpartisan research organization in Washington, D.C., said that certain communities with a history of cross-sectarian strife such as in Lebanon, Bahrain, Syria and Iraq have proven to recover and build trust that defies sectarian lines. "Although sectarian conflict have led to horrific bloodshed, sectarian violence in the region is still the exception rather than the norm," said Jeffrey Martini, the lead author of the report. Citing Lebanon's Beirut Madinati movement, the research team found that political leadership with a non-sectarian agenda and increased cross-sectarian interaction could enhance civil society and prevent the outburst of violence in the face of sectarian-driven armed conflicts. "You need to have alternatives to sectarian entrepreneurs, people who are playing on sect to define their political projects. And to build those alternatives, you really do need conditions for civil society to be able to operate," Martini told VOA. FILE - Beirut Madinati candidates and delegates cheer while monitoring ballot counts for the municipality elections after closing the polling stations during Beirut's municipal elections, Lebanon, May 8, 2016. Beirut Madinati rose to popularity during the garbage crisis of 2015 when a group of civil society activists and independents across sectarian lines organized to protest a swirling sea of garbage on Beirut streets and power and water shortages. 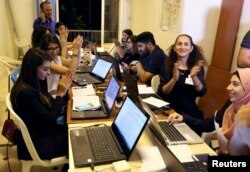 The movement later expanded into a cross-sectarian coalition competing for seats in 2016 municipal elections and winning one of the three Beirut electoral districts. "That is a movement that could not have come about without significant investment and support and an environment for civil society development. The leaders of that movement came out of civil society. Their ability to move beyond sectarianism was the result of their experiences with civil society," Martini told VOA. Beyond Lebanon, the research found that communities with significant cross-sectarian mixing and strong civil society in Iraq, Bahrain and Syria were less hit by sectarian-driven conflict. One researcher, Justine Gengler, charged that in communities with limited cross-sectarian mixing, government employment, access to public services and perceptions of economic well-being are contingent on sect. In Bahrain, where the majority-Shi'ite population claims to be repressed by Sunni rulers, the sectarian strife is significantly small in mixed towns, Gengler said. He found that "Isa Town — where residents have frequent exposure to sectarian mixing and where the stark division between Sunni and Shia are mitigated by the mixed nature of the community — was less prone to sectarian violence and Sunni reprisals against the Shia during the uprising. Lacking the same basis for community resilience, Hamad Town featured violent clashes and retribution." FILE - Sunni protesters wave a Bahraini flag as they protest, demanding the government end chaos in their country, in Hamad Town south of Manama, Dec. 24, 2011. Gengler said in Hamad Town, Sunni militias were defending their communities from neighboring Shi'ite villagers. In Syria, where a civil war has ensued since the Arab Spring protests in 2011, communities with a strong civil society away from foreign influence remained less hit by war, the researchers found. The United Nations estimates more than 400,000 Syrians have died since 2011, with over 6 million displaced internally and some 5 million seeking refuge abroad. Kathleen Reedy, one of the report's co-authors, found that Daraa governorate near the Jordanian border in southwestern Syria remained largely resilient to the inroads of Sunni sectarian actors as compared to Idlib in northwest on Turkey border. The key difference between the two Sunni governorates, according to her, is in the approach of external state actors. Reedy said Turkey was abetting sectarian actors in Idlib in the service of broader Turkish national security interests as opposed to the U.S. and Jordan's involvement in Syria's Daraa governorate, where both countries limited their assistance to the "moderate opposition." "Early on in the war, Turkey's overriding objective was the overthrow of the Assad regime, which Turkey saw as an impediment to stability on its southern border. Over time, that objective has evolved into checking Kurdish autonomy, for which the Sunni-Arab opposition forces are a useful partner. ... In contrast to Turkey, the Hashemite Kingdom (Jordan) and the United States have taken a much stricter approach to the opposition that operates on the Jordanian border," she argued. The Middle East experts concluded that the international community could work with Middle Eastern governments to curb sectarianism by helping mediate the early onset of conflict and accomplish strong border monitoring. "We found that a number of policy measures can help counter sectarianism even in highly divided societies, including improving border controls to cut off the flow of resources and fighters from foreign sources, limiting foreign funding to sectarian leaders and encouraging space for civil society development," said Dalia Dassa Kaye, director of Rand's Center for Middle East Public Policy, and a report co-author. "In other words, endless bouts of sectarian violence are not inevitable in the Middle East," she added.